Fairfield - Anne (Rowley) Howrigan, 85, was born on January 19, 1932 and on August 9, 2017, Dad took her hand again. Anne was the tenth and youngest child of Lawrence J. and Helen (Shanley) Rowley of Milton. 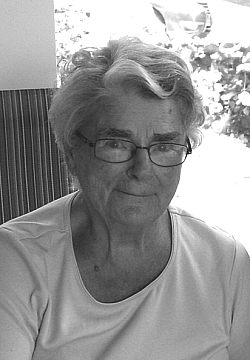 Anne was educated in the Milton school systems and graduated from the University of Vermont in 1953. Anne excelled at all that she did as a young woman. She was in the National Honor Society, the All-State band with her coronet for four years as well as a leading softball and basketball player. Anne married Harold J. Howrigan of Fairfield on August 8, 1953, at St Ann’s Catholic Church in Milton; they were married for 56 years until Harold’s death on September 7, 2009. Mom cherished her role as a wife, mother and grandmother and modeled devotion, love and commitment. Dad and Mom’s social calendar was second to none. They never missed a gathering (no matter how many on any given weekend) and never missed Sunday mass. They demonstrated their motto every day for us: Never any younger. Never any closer. Anne loved the farm and farming; she always knew what projects everyone was working on and kept a close eye on progress. She kept the crew going and that kept her going. Mom was the original teamster whether as a 13-year-old chauffeur for her Dad or teaming the horses with Harold. Sugaring was a special time of year for her and she rarely missed a boiling at the sugarhouse. Anne was a communicant and choir member of St Patrick’s Parish in Fairfield for 64 years and organized the annual St Patrick’s day show. Anne never stopped teaching and sharing her knowledge during her 40 years in the classrooms of Fairfield, authoring books (Fairfield Reminisces, Howrigan Family Cookbooks, the Collection of Rowley Letters and the Rowley Heritage) and organizing parties of all sizes and occasions. She was active and generously shared her talents in many organizations including local, state and national Education Associations, and town and county Democrat committees. Anne was our Mother of the year every year, and, in 2004, was recognized as Vermont’s Mother of the Year. Anne was the most compassionate person with a heart of gold. She took care of her family first and barely distinguished between her immediate and extended family. She was the first to reach out during a time of need to offer her quiet strength and support. Her faith was her compass and she instilled that in each of us. She knew first hand that faith needs to be the strongest when put to the hardest test. Mom was fiercely loyal! Loyal to her faith, her community, her students and her grandchildren. Especially her grandchildren. Each of the grandchildren enjoy a special bond with Grandma; she was their biggest fan, an influential role model and a friend. Her life goal was to pass along her advice, knowledge and faith to those who followed. She never missed an event. Her family is her greatest legacy and her greatest source of pride. Two of Mom’s most recent outings were for the Howrigan family reunion three weeks ago and the Rowley reunion last Saturday. In addition to her husband, Harold, Anne was predeceased by her parents LJ & Nell Rowley, her 9 siblings and spouses: Drs. Mary Rowley & William Busino, Elizabeth (Rowley) & Vern Duffy, Theresa (Rowley) & Phil Cosgrove, Lawrence & Theresa Rowley, Frederica Rowley, Al Rowley, Patrick & Maysel Rowley, Joan (Rowley) and Dan Hurley, and John Rowley and her siblings-in-law Francis & Neva Howrigan, W. Robert Howrigan, Dr. Thomas Howrigan, Sgt. Raymond Howrigan, Bernard & Mary (Howrigan) Connor, Emmett & Rose (Howrigan) O’Connell, and Fred Connor. Anne is survived by her five children and their spouses, 13 grandchildren and their spouses and 3 great grandchildren: Bridget (Howrigan) & Gerald Rivet, Lawrence & Lisa Howrigan (Cullen & Kathryn), K. Michael & Penny Howrigan (Ryley &Tim and Kiley & Nick, Kyrielle & Kaden Deuso), Harold Jr & Elizabeth Howrigan (Harold III, Brendan, Morgan & Lanie, Amy & Josh Boyle, and Adam) and Ellen Howrigan Paradee (Emerson, Austen, Brennan and Oliver). She is also survived by sisters-in-law and spouses: Ann (Lombard) Rowley, Virginia (Mawn) Howrigan, Henry & Loretta (Howrigan) Magnan, Kathleen (Howrigan) Connor and John & Teresa (Howrigan) Manahan. Relatives and friends are invited to attend calling hours on Sunday, August 13th, 2017, from 5:00 to 8:00 P.M. at the Heald Funeral Home, 87 South Main Street, St. Albans. A Mass of Christian Burial will be celebrated on Monday, August 14th, at 11:00 A.M. in St. Patrick Catholic Church, 116 Church Street, Fairfield, with the Reverend William Giroux as celebrant. Interment will follow in the St. Patrick Catholic Cemetery. In lieu of flowers, please consider a donation to the Harold J. Howrigan, Sr. Scholarship Fund, c/o Bridget H. Rivet, 329 Pelkey Road, Fairfield, Vermont 05455. To send Anne’s family a written expression of sympathy or share a memory, please go to her on-line guest book at www.healdfuneralhome.com.